The spinal column consists of 24 oddly shaped vertebrae, the top seven of which form the cervical spine in the neck. 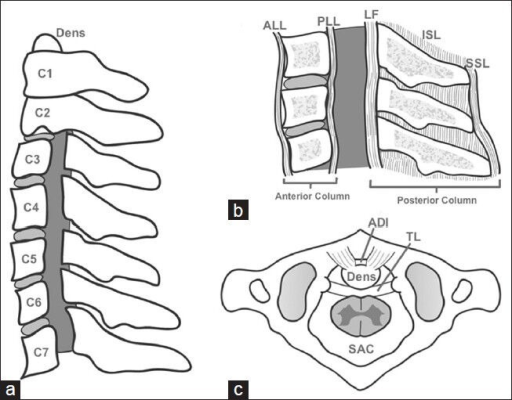 The top vertebra, or atlas (C-1), and second, or axis (C-2), are followed by five more vertebrae (C-3 to C-7). The spinal column protects the spinal cord, which is the long bundle of nerve fibers that transmit signals from the brain to the rest of the body. The cervical vertebrae have triangular vertebral foramina, a transverse foramina and bifid spinous process. The transverse foramina are holes in the transverse processes through which pass the vertebral artery, vein, and sympathetic nerves. Joints that are unique to the cervical spine connect the spine to the cranium and connect the first two discs of the cervical spine. The joint between the atlas and axis, the top two discs of the cervical spine, is called the atlantoaxial joint. The atlantocciptal joint connects the spine to the cranium. Running the length of the spine are anterior and posterior longitudinal ligaments, which run the length of the spine covering the vertebrae and the discs between the vertebrae. The ligamentum flavum and interspinous ligaments connect adjacent vertebra. There are special ligaments in the cervical spine, including the nuchal ligament, which attaches to the spinous processes from C1 through the C7 level and connects to the rhomboids and trapezius. Another ligament helps to holds in place the dens, which is a bony extension of the atlas, or top most cervical vertebra. Between the discs of the cervical spine are discs made of tough fibrous cartilage that act as shock absorbers between the vertebrae. In the center of these discs is the nucleus pulposus, a softer gel like material. Surrounding the nucleus pulposus is the annulus. The disc structure is essentially the same throughout the spinal column. The muscles of the neck allow the neck and head to move. There are five major muscle groups in the back of the neck, including the trapezius, splenius, posterior cervical muscles, suboccipitals, and levator scapula. The trapezius muscle connects the neck, shoulders and back and are used to lift the shoulders up toward the ears. The levator scapula connects the neck and shoulder and helps to lift the shoulders and turn the head. The splenius muscles connect the back of the head and neck and are used to rotate the head and tilt it backwards. The suboccipitals connect the skull with the two top vertebra of the neck and are used for the up and down and side to side motions of the head, as well as side bending. The posterior cervical muscles on the back of the neck extend your head backward. There are muscles in the front of the neck as well, but they are less commonly injured. Most people at some point in their lives will suffer from neck pain, which can result from overuse, acute injuries, or everyday wear and tear. Neck injury symptoms range from stiffness to severe pain, which may spread to the shoulders, upper back or arms, or cause a headache. Movement of the cervical spine may be limited, and the pain can run anywhere from the base of the skull to the shoulders. While typically neck pain is caused by injuries to the neck muscles or neck joints, neck injuries can result from falling, excessive twisting, whiplash, direct blows to the back or top of head, and other causes. If you have pain or numbness down the shoulders, arms and/or legs, this may result from muscle spasm or a burner, which is an injury to one or more nerves between your neck and shoulder. A burner is ordinarily not a severe injury, but the symptoms of numbness and tingling may indicate a very serious injury, and you should seek medical treatment immediately. If your neck is stiff and you're having trouble moving the neck without pain, you may be suffering from muscle spasm, arthritis, or even fibromyalgia. If the pain is not particular significant, you can use the anti-inflammatory drugs, but you need to see your doctor if these symptoms persist.You also may be suffering from degenerative cervical disc disease or an aggravation or acceleration of underlying disc disease if you suffer slow onset of pain or an acute increase in pain that following an injury. A cervical disc injury is a serious condition for which you need immediate medical treatment. The center of an intervertebral disc is a gel‑like material called the nucleus pulposus. Tears in the structure surrounding the nucleus pulposus may cause the center of the spine to leak out and press against nerves that extend to your arms, upper chest or head. Careful treatment is required immediately under those circumstances. Pennsylvania attorneys representing people with neck injuries should have a basic understanding of neck anatomy and the mechanics of injuries to the cervical spine. if you are considering a lawyer for your injury case who does not understand basic concepts about this condition, you should seek a new attorney. for information on how to find the best attorney for you, read chapter 6 of The Wounded Worker: Inside the Workers' Compensation Maze. For a more detailed discussion of neck injuries with helpful links to articles, click here.